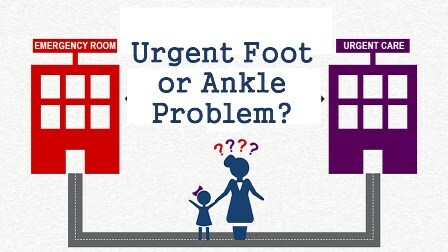 Urgent Foot or Ankle Problem? There is no need to go to a local Emergency Department or an Urgent Care center only to be referred to our office for a specialist follow up. We can save you time AND money. Come directly to us and skip the long waits at the Emergency Room and Urgent Care Centers. We will see you right away and address your needs. This is quicker and less expensive than your typical Emergency Room or Urgent Care facility.